It is quite a thrill to see an ancestor's name on a ship passenger list. You are sharing the first moments of the person's arrival in a new country. While the feeling is remarkable, these manifests also contain important genealogy information. That's why they are an important research tool. In order to find a passenger list, it's important to understand the historical context. Regulations and immigration laws changed over the centuries. These changes greatly effect how you locate the records and what you find in them. The first permanent settlement in the United States was in Jamestown, Virginia in 1607. For the next 200 years, immigration would be sporadic and mostly undocumented. 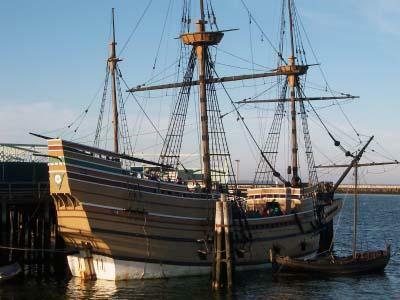 While there are some early passenger lists, the most notable being the Mayflower in 1620, they remain relatively rare. There was no governmental requirement for documenting immigrants. It was up to the shipping company's policy. For those companies that did keep records, many of those records did not survive over time. Immigration to the United States was slow during the American Revolution and the following years. European wars restricted the migration. Following the War of 1812 with Great Britain and the Napoleonic Wars in Europe, immigration began to climb sharply. By 1820, the Federal government decided it was time to act. The Bureau of Customs began keeping "Customs Passenger Lists" to document the arrivals. Blank forms were provided to shipping companies and were completed by the ship's captain. These forms were then presented to the port authorities upon arrival. The decades between 1820 and 1850 showed a dramatic increase in the arrival of Europeans into the United States. Refugees from war-torn European, along with the Irish fleeing the Potato Famine came to the New World for new opportunities. From 1850 to 1891, immigration continued to grow. Large numbers of Germans, British, Irish and others from European countries came to settle the Midwest and western parts of the country. In 1891, the United States government again took action by establishing a Superintendent of Immigration, later called the Immigration Bureau. The Bureau regulated the forms for documenting new arrivals as well as exerting control over the actual port of entry. New York's Ellis Island was established as the main port of entry for entering the United States in 1892. Over 12 million immigrants passed through Ellis Island before it ceased operation as a receiving center in 1924. The largest percentage of these newcomers came from Italy, Eastern Europe and Russia. Through this entire time, the Bureau, later called the Immigration and Naturalization Service, kept the records for all those arriving. The National Archives (NARA) is entrusted with all ship passenger lists since 1820. These lists have been microfilmed and are available at regional archive centers. The NARA site has some lists, such as passenger lists for the Port of New York during the Irish Famine 1846-1851, in database form on its website. Numerous books have been published of passenger lists over the last 400 years. Check with your local library for these books. Microfilms of the NARA lists area also available through the Church of Jesus Christ of Latter-Day Saints Family History Centers. The Family Search website has a list of Family History Centers. The Ellis Island Foundation has a database of those immigrants entering the U.S. through Ellis Island from 1892 to 1924. Ancestry.com has numerous passenger lists databases, including those for Baltimore, Boston and New Orleans. Ancestry charges a subscription fee, but many public libraries offer it to patrons for free. Olive Tree Genealogy has a variety of lists, such as early Huguenot arrivals. Cyndi's List has an index of passenger lists sites.